If you want to know when the heatwave is going to end, I can tell you with confidence it will be on Friday. I know this for a fact because we’re going on our annual camping trip this weekend and I’ve never camped in anything less than torrential rain. I’m not a natural camper but once the tent’s up and the wine is poured I do like being outdoors and sitting around the campfire if it’s dry. Every year we go away with the same friends – my NCT group. The group has expanded to its current tribe of 12 adults and 15 kids, currently all age six and under. It sounds like chaos but Big Bear in particular is happiest when he’s outdoors and the trip has worked well for the last five years. Usually we all camp in tents but this year we’ve opted for cabins – one-room wooden pods. It feels a bit like cheating, although I know when we get there and J and I don’t have our usual ‘putting-up-the-tent-argument’ that I’ll be able to make peace with that. Plus we’ve got another camping trip with the tent coming up in a few weeks so, you know, we’ve not completely forgotten our roots. 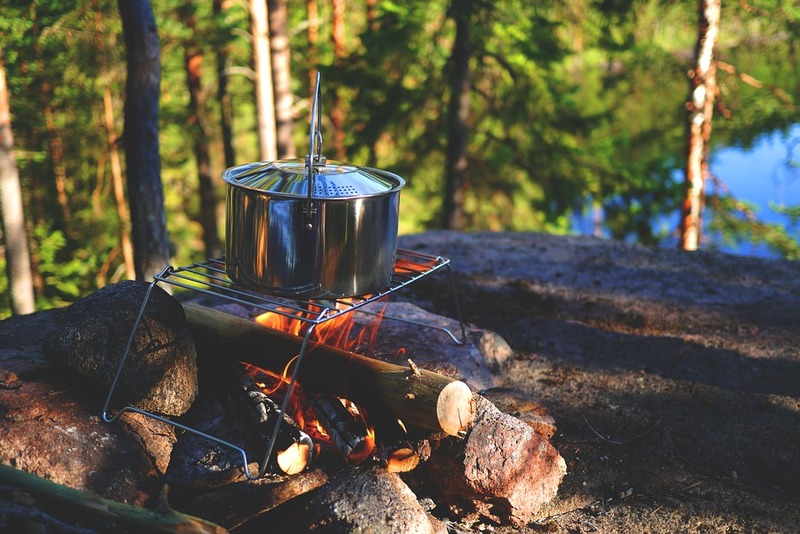 If you go camping more than once a year, consider putting together a few camping boxes to make packing easier. I have two large plastic boxes with lids: one filled with kitchen utensils/pots/pans and one for camping equipment/supplies, such as pegs, tape, a mallet and lanterns etc. Each box has an inventory on the side so I know exactly what’s inside each one. Whenever we go camping I just take the boxes out of the shed and pop them in the car. Don’t forget to make sure everything’s still in there when you come back and make a note to replace any missing items. Packing cubes are squashy bags you can use to divide up some of your stuff, eliminating the stress of digging through suitcases. When I discovered them last year, it was a game changer. We use different coloured cubes for each person’s clothes and they make packing and unpacking a lot easier. Label your packing cubes so each child has one for ‘bottoms’, ‘tops’, and so on. Shoe organisers can be used for storing a huge array of stuff that doesn’t include shoes. Hang one inside your tent and you have a portable organizer for anything you need to keep off the ground: utensils, kitchen equipment, food, and more. The great thing about using camping boxes is that they can also be doubled up as washing up carriers. We use our camping accessories/supplies box for transporting dirty cups and plates to the sinks at the campsite. There’s nothing worse than scrabbling about for things you can’t find in a tent. Make trips to the shower block easier by having a bag for the shower packed at all times so you can just grab and go. Have one for each family member. 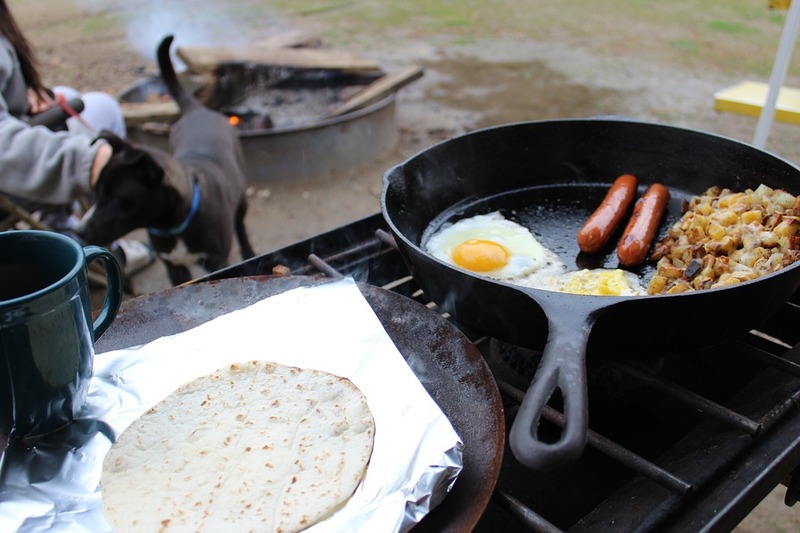 If you have a camping stove, make a list of one-pot meals you can cook at the campsite. Make life easier and take your first night’s meal with you so you only have to heat it up. One of the worst things about camping is the trail of mud that makes its way into the tent. Eliminate the mess by using an old piece of carpet, a mat or a small picnic blanket from the pound shop and taping it to the floor at the entrance of the tent to use as a doormat. Ok, mud in the tent is bad but, for me, the WORST thing about camping is trailing across a cold, damp field in the middle of the night to go to the toilet. We use a cheap portable camping toilet in the tent which is only used for night-time emergencies. Forget air beds and sleeping bags, the most comfortable way to sleep in a tent is on a self-inflating mattress with a warm duvet and a hot water bottle. Toasty! For extra warmth, lay a yoga mat under your child as a protective layer from the cold ground and as a comfortable pad. Camping with a baby? Keep them warm at night by dressing them in a vest, two sleep suits and putting them in a gro bag inside a mini sleeping bag in their travel cot. The Bears had their best nights sleep as babies with this arrangement. As mentioned above, do not, I repeat DO NOT forget your hot water bottle. It’s an essential piece of kit that will keep you cosy whilst sitting outside in the evening. Pop it into your bed before you get in a night to ensure you get the best possible sleep. Rig up a torch or battery-operated light on the ceiling of the tent to avoid tripping over things in the dark.